At the moment we run our testing on AWS c4.large, using WebPageReplay to replay our pages. 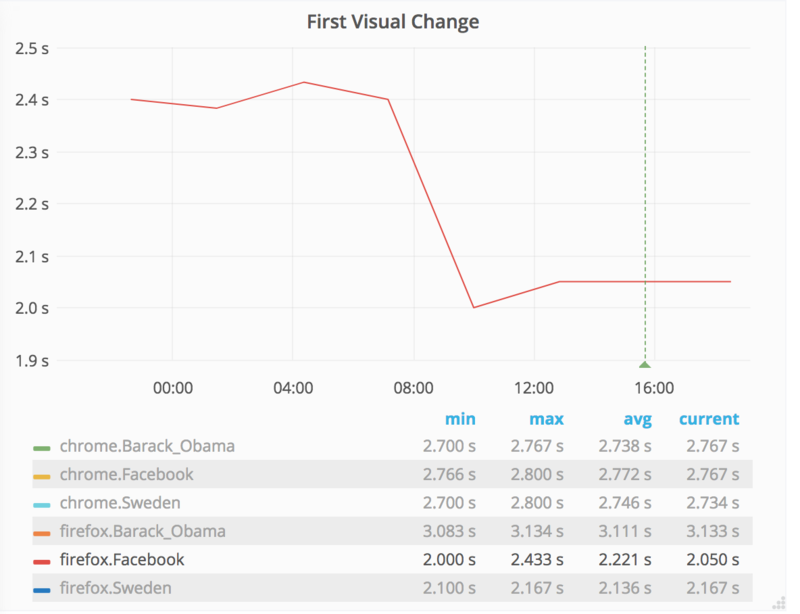 When we run our tests on desktop with Chrome we can find regressions in first visual change that are 40 ms or higher. With Chrome we also use the Chrome trace log (where we can get CPU stats of where Chrome spends time) where we can find regressions that are 20 ms or higher. For example this setup helped us find a regression in Chrome 67 when the Chrome team changed their music/video player https://bugs.chromium.org/p/chromium/issues/detail?id=849108). With Firefox we don't get that stable metrics so we can alert on them. Our alert threshold would then be something like 500 ms. We have turned off all the things (that we know about) that can make metrics with Firefox unstable (like the background update of 3rd party blacklists etc) but it doesn't help. Most of the pages for us have two buckets of metrics. For example if we make 11 test runs, X runs is fast and Y runs is slow (and the difference could be like 1 second, so it is a big diff). Using Chrome the diff is max 100 ms.
We see unstable metrics with WebPageTest without WebPageReplay too, so it seems not to be tool related. However some URLs are more sensitive than others, so content matters. This could either be something special with Wikipedia pages that doesn't work well with Firefox, something in our Firefox setup that we do wrong with the tools, or a generic Firefox problem. Here's another example. 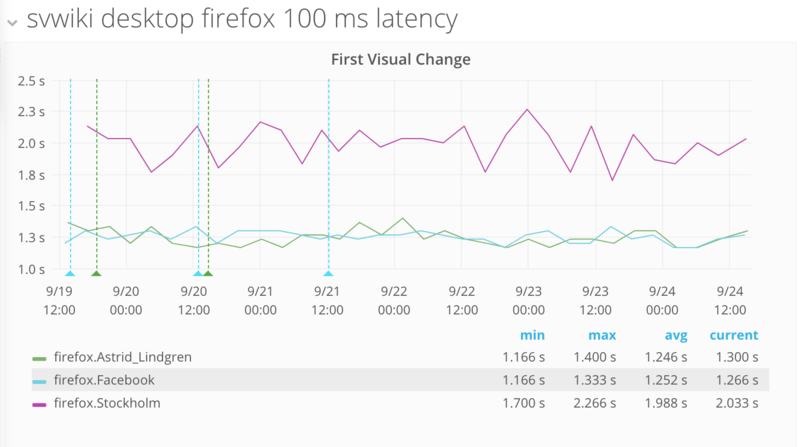 These changes made First Visual Change go down 400 ms.
Hmm been checking individual runs and for Firefox when we do 11 runs the variance can be 500 ms (for chrome it is 100 ms) between runs so I wonder maybe it is some configuration issue? We turned off OCSP and black/white list update but maybe it's something more that needs to be disabled. The mdev are the same though. Let me try to turn on the HAR exporter again and also see if I can identify which preferences that do the trick. This is driving me crazy :( I've verified that Firefox is using the proxy (by removing internet when replying the data), it works. 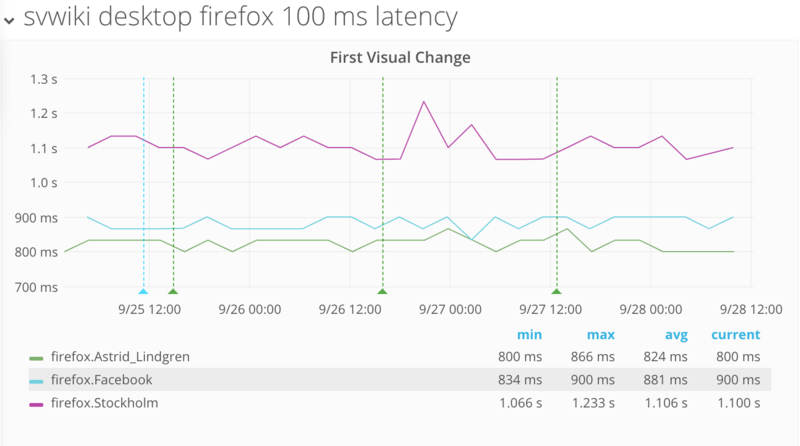 However both using the proxy and doing run without the proxy the Firefox metrics has high variance: Running Chrome without setting any connectivity, not using the proxy the variance is 100 ms, the same and less when we use the proxy. 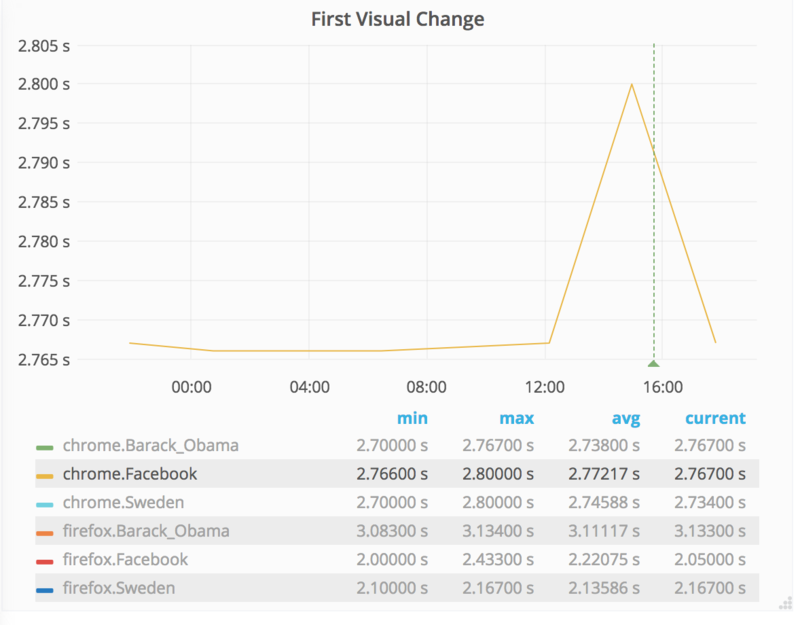 For Firefox the variance is 1000 ms of firstVisualChange both with or without the proxy. I wonder if there's something in the Docker setup that can explain it? When I check the HAR file and compare with a run with the same connectivity, the HAR is mostly identical except that the timings differs 1000ms (so the HAR doesn't help). I'll test if I see the same without Docker and also collect the MOZ log but I think it is a trace log of what Firefox is doing that's missing. So far I tried to rollback to stable 58, disable ipv6 , increased the file limit on Linux but no luck so far. I've tried out different preferences, and stopped more type of requests in the background (setting network.captive-portal-service.enabled to false). Haven't been able to track down more requests in the MOZ-log so it is probably ok for now. I've been going through the logs (and comparing Chrome vs Firefox) and Firefox seems to always render in about DOMInteractive. For both of them we have two buckets of DOMInteractive: For Chrome it is more stable, for example when we test https://en.wikipedia.org/wiki/Facebook we have one bucket if 515 ms and one 1014 ms. If we do 11 runs, we get a couple of runs in the first bucket. But a DOMInteractive 512 generates a first visual change at 1100 and DOMInteractive: 1019 also lands at first visual change 1100. 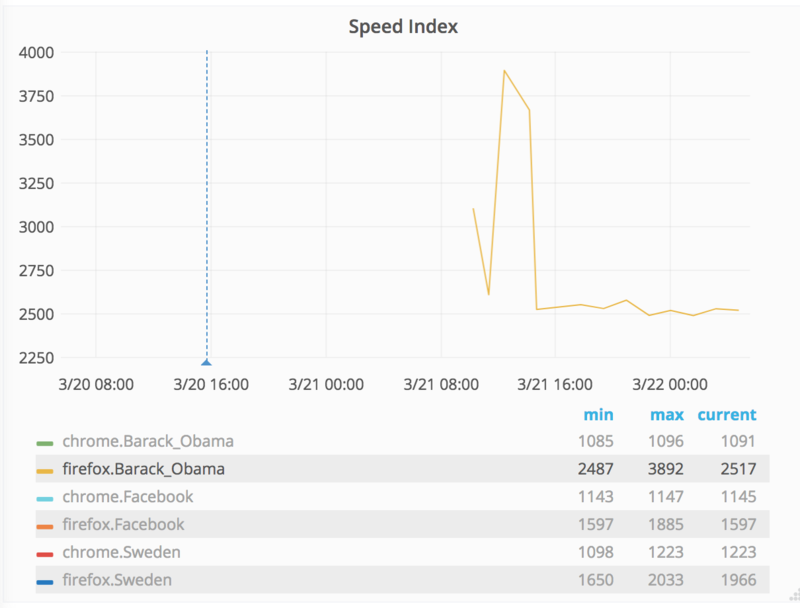 Firefox when we test Sweden and get a DOMInteractive at 1626 the first visual change is 1600. When we get a DomInteractiveTime at 2042 the visual change happend at 2034. The same for the rest of the URLs. Also another interesting: When I turn the MOZ log it adds aprox 1s to each metrics, so that could be one of the reasons why FF is so much slower than Chrome on WebPageTest. Attaching a HAR where we have the diff (almost 1 second) in first visual change between first run and third run. Hmm we miss the user timings in the HAR, let me add those. That time makes almost up the big difference in first visual change. There's no way to get more info out of FF when we automate it, so let me try running it manually with some connectivity limits. https://aus5.mozilla.org/update/3/GMP/61.0a1/20180317134556/Linux_x86_64-gcc3/null/nightly-cck-ubuntu/Linux%204.9.87-linuxkit-aufs%20(GTK%203.22.25%2Clibpulse%20not-available)/canonical/1.0/update.xml (love that null in the URL). When I run on Mac OS X there's no requests to any .mozilla.org domain (using the same configuration for the preferences). But I cannot say it's that that cause the variance because it looks mostly the same for different runs, but let me at least file an upstream bug. Peter moved this task from Doing to Next in FY1819Q3 (Jan-Mar)	on the Performance-Team board. Imarlier added a subscriber: Imarlier. Blocking us from setting up alerts on Firefox. I would say this is mainly a problem for us with Browsertime/WebPageReplay since it is there we get so low variance for Chrome. But we see the same kind of thing on some pages on WebPageTest too. I've been looking at other sites to see if I could find the same pattern. I thought I found one but digging to the problem it seems that the site loaded blocking CSS from Google and in Firefox that sometimes took a looong time. Interesting but nothing for us to look into. [2018-09-14 11:38:28] INFO: Changing network interfaces needs sudo rights. Check the big difference for first visual change. It differs over one second. [2018-09-14 10:44:08] INFO: Changing network interfaces needs sudo rights. On that machine the difference is a little bit more than 200 ms. I think we should try to beef up one machine on AWS and try on that. I've pushed c4.xlarge and a c5.large to see if there is any diff in the metrics. We run tests for FF and Chrome but emulated mobile, the same setup as our normal tests (30fps for the video). Let us run that today and then we can also try to increase fps to 60 (as we do for mobile) to see if we can get even better metrics. I tried out a couple of different settings and will keep the instance running for the rest of tomorrow. First things first: Is Firefox more stable on a bigger server? [2018-09-17 11:47:27] INFO: Changing network interfaces needs sudo rights. [2018-09-17 11:57:12] INFO: Changing network interfaces needs sudo rights. [2018-09-17 10:57:01] INFO: Changing network interfaces needs sudo rights. [2018-09-17 11:06:24] INFO: Changing network interfaces needs sudo rights. Hmm here we we see the same pattern as before. [2018-09-17 11:05:23] INFO: Changing network interfaces needs sudo rights. [2018-09-17 11:14:21] INFO: Changing network interfaces needs sudo rights. [2018-09-17 11:37:30] INFO: Changing network interfaces needs sudo rights. [2018-09-17 11:46:22] INFO: Changing network interfaces needs sudo rights. Yeah that was a lot of metrics :) Let me summarize: Different URLs/content behave differently (we know that before but we need to always think about that. It seems like going in a larger instance gives us more stable metrics for Firefox, maybe a c4.xlarge is the way to go, We could then maybe run only Firefox on that instance. But let us collect some more metrics first. 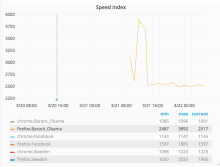 We run 11 runs each and take the median first visual change and median Speed Index. The runs on the c4.large is our normal tests. One thing to note is that it seems that instance has become more unstable the last month(s) see T204300. I've deployed Firefox tests permanently on a c4.xlarge T205246 and it looks good so far. This is better now, let us close it.